BUILT BETWEEN 1908 and 1910, the former Schöneberg gas storage and supply tank – better known as the Gasometer – remained in active use for over 8 decades. Finally decommissioned in 1995, its skeletal frame still looms over central Schöneberg. Similar structures remain all over Europe, and are especially prominent in the greater London area, where they form an integral part of the post-industrial landscape. 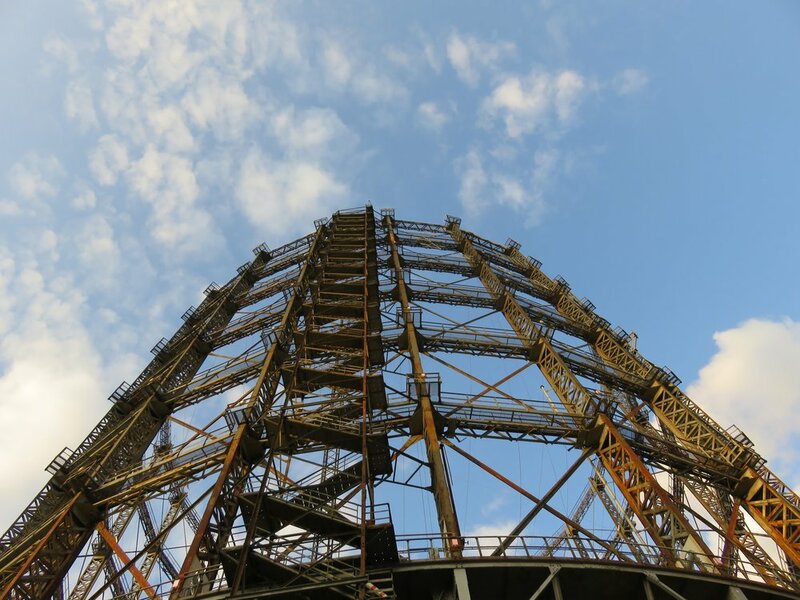 The term "Gasometer" refers to the tower's former inner mechanism, a massive, flexible enclosure that would rise as the chamber filled and fall as it emptied. The building itself thus served as its own meter, indicating to the neighborhood at large how full it was. The expandable chamber was set above a pool of standing water (allowing the gas to expand and contract while remaining inert), the shell of which remains on the current structure and now functions as an event space. Designated as a monument in 1994, the structure is closed to the general public, but offers guided tours to limited groups. Each ring of the tower consists of a circular access path with walkways of metal grating, and is accessed via several steep metal stairways. 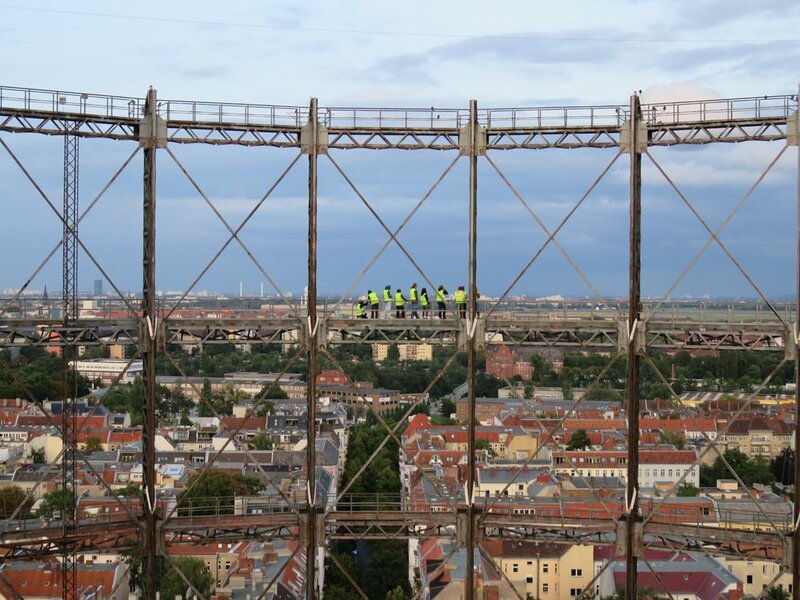 Even compared to other round structures, the view from the Gasometer is truly three-hundred-and-sixty degrees, with lines of sight leading not just outward but through the tower. Nearby buildings visible from the structure's middle-to-high levels include the Rathaus Schöneberg and both the north-south and Ringbahn S-Bahn lines; distant ones include the Fernsehturm, Berliner Dom, Sony Center, and even the distant ruins of Teufelsberg. The view across the center of the structure, with a group of yellow-vested visitors for scale. The view to the northeast, with the Berliner Dom and Fernsehturm in the distance. A flock of magpies at the top of the tower. The roof of the modern hall at the foot of the structure. For info on tours in either German or English, click here.